Starting in daily build 2016.3009, we are changing the minimum supported version for Android from 2.3.3 to 4.0.3. From this build onward, Corona device builds will not run on an Android device whose OS version is below 4.0.3. Some core Corona features that we wish to implement are only practical if we drop support for Android builds older than 4.0.3. For example, going forward, we need to place application icons in the .apk‘s /res/mipmap directory instead of /res/drawable. This is now required for apps to be featured on Google Play. Around the time of this writing, roughly 1.2% of Android devices use 2.3.3 – 2.3.7 and less than 0.2% use 3.0 – 4.0.2. Thus, it no longer makes sense for us to invest time and energy on preserving OS versions of the distant past. Dropping support for older OS versions is not something we do casually or lightly — we want Corona developers’ apps to run on the largest platform-respective OS base as possible. 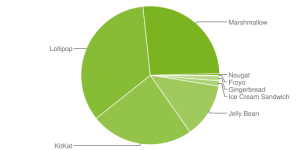 However, with less than 1.5% of Android devices using versions older than 4.0.3, along with Google encouraging (and sometimes enforcing) newer features, we feel this change is mandatory. Please join us in the Corona Forums if you have questions or concerns on this subject.